Eric Johnson is on the move. No, he's not playing dates - not at the moment anyhow, although he's just wrapped up the fall run of the Experience Hendrix tour and will hit the road again in January for the second leg of the Guitar Masters tour. Johnson is in the middle of packing up his house in Austin, which he sold recently, and he admits that the process is a stressful one. "I didn't plan on moving so fast," he says. "I put my house on the market while I was on the road, not thinking that it would sell so quickly. But it did, so now I've got to get all of my stuff together and put it in storage. I'm building another place in Austin, which will take a year or two, so I'm going to have to lodge temporarily at another residence." 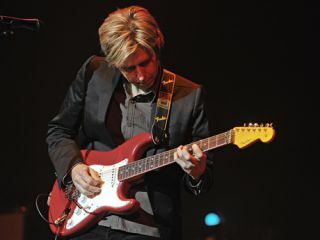 With his astounding new album, Up Close, just released and receiving rave notices (check out our extensive track-by-track guide, with thoughts on each cut from the guitarist himself) and a 2011 solo tour in the works, it's inevitable that Johnson's temporary residences will also include many hotel rooms. "I'll definitely be touring behind Up Close as soon as I can," he says. "I'm really looking forward to playing these new songs live." While packing boxes and dealing with moving men, Johnson recently took some time out of a hectic day to answer questions from MusicRadar readers. Craig Williams says, I totally love Up Close. I think it's your best album since Ah Via Musicom. Can you describe what it was like to record? You seem to labor over your albums in the studio, but from what I've read on MusicRadar, that wasn't the case this time. "Wow, thanks so much for the compliment. I'm really glad you like it. That's true, I didn't labor over it - not in the same ways as my other records, at least. Well…different ways, maybe. [laughs] The most fun I had on Up Close was when I basically played live and saw where the songs wanted to go. I let them guide me, as opposed to the other way around. In the past, I would always try to force a song to do what I wanted, and I think that results in music that sounds sterile and artificial. On Up Close, I tried to avoid that at all costs. I wanted the songs - and the whole album, really - to feel natural and spontaneous, like people playing music together for the very first time. "A big plus was having a bunch of other musicians and singers come in and add their own two cents to the tunes. That really made the whole studio experience joyful and fun. Recording an album definitely requires work, but I wanted to keep the emphasis on 'playing' and not 'working,' if that makes any sense." JP Holesworth@Stratoblogster says, Jeff Beck has signature guitar models with both Fender and Gibson. If the opportunity for a Gibson EJ-335 presented itself, would you be interested and able to help create such a model? "That's a really good question...and an intriguing one. The truth is, I had wanted to do that very thing, and there were some people at Gibson who were into the whole idea. When it got to the higher-ups, however, they kind of nixed it. It was pretty strange. I tried to get something going with the company. I talked to some of the people there, and they were like, 'Yeah, let's do it. Call this guy at this number.' So I'd call up and…I don't know, they just sort of dropped the ball on everything. "Eventually, I blew the whole thing off, which was a drag because I love the red 335 from 1964. I was looking forward to trying to work with Gibson on some pickups and get going on a model that was really cool and special. What can I say? I guess they weren't interested in pursuing it with me. [laughs] It happens." Trundrumbaland1976 asks, What are your memories of opening for Rush during the 1991 Roll The Bones tour? Also, are there progressive rock or metal bands that you favor? "It was great being on tour with Rush. I really loved hanging with those guys and getting to know Alex Lifeson a bit. They're such pros, man. I learned a lot about touring and how to put on a show from watching them and their whole crew. They're seasoned veterans. Watching their entire operation was pretty eye-opening. "As far as metal and progressive music…hmmm. I don't know if you'd call Steve Morse 'progressive,' but he's amazing. Gentle Giant did some interesting stuff, of course. John Petrucci's an excellent player. Everything I've heard him do has been very solid and cool. [pauses] Wow, I'm kind of stuck here. Would you call Nirvana a 'metal' band? Probably not. Still, I always thought Kurt Cobain was a brilliant songwriter." Isaac Defee says, During the past few years, I have noticed a change in your approach to soloing. Your technique sounds more rhythmic in nature, where notes are sometimes played almost like a pulse as opposed to in and out of beats. The descending pentatonic lines in the song Austin exemplify this. Has this change been conscious, or is it a natural evolution in your playing? "You know, it's funny: I had a conversation with a friend of mine who said something along those very same lines. He thought a lot of my notes were kind of sounding the same rhythmically - you know, like 'da-da-da-da-da-da-da-da.' He thought I should break up the attack a bit more, change up the picking style - be a little more out of the pocket in some places. Juan Espino asks, What are your thoughts on the current instrumental guitar scene? What do you think of the state it is in, and where do you see it headed? "I think there will always be an audience for guitar music. On the other hand, we've pretty much taken things to the hilt in terms of the guitar hero thing. For somebody to come along and change things in a major way, they'd have to be doing something pretty fresh and unique. I guess we'll all just have to wait and see if that happens. But there's still guys out doing it, and they do it well, so I tip my hat to them." Kiaran Jay asks, How do you deal with writer's block? Do you move away from playing for a while, or do you jam until you find something cool? "I basically jam until I find something cool. I think the less we worry about stuff like writer's block, the less we own it - or let it own us, if you want to look at it that way. More and more, I try to treat it like the wind: I let it breeze right by me. I figure, if I don't fixate on writer's block, it won't stick to me. "On a practical level, if you're playing and you're stuck in a rut, stop playing whatever it is that's bogging you down. Play something else, play something fun. Just play with no expectations or goals. Too much of the time we focus on the result: 'If I play this or write this, then this will happen.' You have to get out of that mindset. It really comes back to the reason why you probably started playing in the first place - because you enjoy it." Tuki from Calcutta asks, How do you keep finding that special place from where music flows? Also, what's it like knowing that you are worshiped not only as a musician but also as a godly person? "But I do feel that a lot of those concepts will ultimately reflect in what you do, be it as an artist or whatever you do in life. The less emotional luggage you have, the lighter you are, and you become transparent and more open to inspiration. It's really there all the time anyway - you just have to find your own ways to become receptive and take in all the positive energy that's floating around you. And the great thing is, everybody can have it; nobody's excluded. Nobody gets more, nobody gets less - it's all up to you." Stratcat51 says, Eric, your respect for the talents of Clapton, Beck and Hendrix has been conveyed on numerous occasions. Are there any non-guitar players that had a profound impact on you? "Oh, definitely! Without a doubt, Stevie Wonder is at the top of the list. As a songwriter and musician, he's been a major influence. I'm such a fan of his work. There's other people, too: I love Miles Davis, especially the old, early records he did with the sextet. Weather Report - Joe Zawinul was a great composer and pianist. Bill Evans was fantastic, so he's an influence, too. I'm all over the map with who I like. Richard Rodgers, Benny Goodman, Keith Jarrett, Aaron Copland, Stravinsky - I listen to a lot of varied music to get ideas for my guitar playing. Face it: if you just listen to guitarists, you're only going to emulate guitarists. Open you ears to other kinds of music and your playing will blossom in so many surprising ways." Petergrifindor asks, What is the maximum amount of time you can stay away from the guitar before you start to get rusty? "Oh, man, I get rusty, for sure. If I take a break for one day, I notice it. And if I take a break for two days, the audience notices it. [laughs] You really have to keep practicing the guitar all the time - at least, I do. "Now that I'm involved with moving out of my house, I haven't been able to play for five or six days, which is bothering me a bit. But you know, sometimes it can be good to get away from playing, to get out of the corrals and boxes you put yourself in. Coming back to the guitar after some time away can allow you to redefine yourself. It's both good and bad, a yin-yang thing. You just have to find what works, and that can change on you from year to year." Doreen asks, Aside from music, do you have any other special talents? Bryanwright says, I saw a picture of you in which your Strat appears to have a Floyd Rose tremolo system on it. How do you manage to get a tone you're satisfied with using a Floyd? I've always found Floyds to change my tone to where it was extremely bright and brittle. "I don't use a Floyd. I totally agree with what Bryan is saying here. Floyds are excellent as far as keeping your strings in tune, but the price you pay is too high in that you lose aspects of the tone that I like to keep. "I use a Super-Vee locking tremolo, which basically retrofits right onto a regular Strat with absolutely no modifications or screw holes necessary. And it works great! It stays in tune, it does what it needs to do. Am I losing a little tone? Mmmm…not really. It makes it a little different, but not in a bad way; it's just different. I started using the Super-Vees on one of the Hendrix tours because I had to do lead and rhythm and really go crazy with the tremolo bar, and I found I really liked them. They're great." Jourdan asks, When will you be touring Europe? I'm French, but I will travel to see you if needed. "I have no plans to tour Europe at the moment, but I hope to very soon. I'd really like to get over to Europe sometime in 2011. And hopefully, you won't have to go too far to see me." The Wainer asks, What was your worst show ever, and why? [laughs] "It wasn't just one, it was a few. I remember two or three really horrible shows, and they were all because I was sick at the time. I came down with the flu, and it was so bad that I had to go to a hospital to get medication. They gave me this weird kind of penicillin - I don't really know what it was. The drug eventually got rid of the flu, but the side-effect it had on me gave me this depression or something, like I just didn't care about anything. I thought it was just me, but now that I remember the events clearly, three of the four people in the band, including myself, all came down with the same flu. So we all took this medication and felt the same way, just totally out of it. "Man, it was awful. We were up on stage, and not only were we sick, but we just didn't care about anything. It was the weirdest thing. We were standing there playing, being all apathetic, thinking life wasn't worth living anymore. I mean, we sucked! Talk about some rotten shows. A really bad deal. I don't know if there was something wrong with the medication or if we were all having the same allergic reactions or what, but it was definitely a messed-up situation. Finally, we stopped taking the pills and came out of it, but for a time it was a total nightmare." Beed84 says, I know you're obsessed with finding the best possible tone all of the time. But do ever say, "Forget it, let's just plug in and play"? "Yeah, I do. More and more, I feel that way. You know, the Fender Strat is a thing of beauty, so I'm always trying to get everything I can from it. I don't know if I ever will, but I'm trying. Sound and tone, though, they're so elusive and mysterious. I think tone comes from a lot of happy accidents. We can tweak things here and there, but I just try to play around with the guitar and different amps and kind of float around until something cool happens. "The guitar is a funny thing: I'll have a day where I'm playing, and everything sounds amazing. It's like I can do no wrong, and tones and sounds are flying through the air and…you know, it's just pure joy. The next day, I'll plug in and I'll be like, 'What happened? Where did the sound go?' [laughs] It's like, you can control things, but then some days you can't. But you can't get hung up on it. Tomorrow's another day." Lastly, we have a question from Pongoman25, who says, Up Close is utterly amazing. I love the different artists you have singing on some of the songs. When you tour, who is going to handle vocals? Are you going to sing everything yourself? "That's a good question. I don't know. I'd like to find somebody who can sing a bunch of songs and play a little bit, maybe have kind of an all-purpose person. I don't know who that person is yet. I'm going to have to start looking."